Under Article 13 of the proposal, sites that allow users to post text, sounds, code, still or moving images, or other copyrighted works for public consumption will have to filter all their users' submissions against a database of copyrighted works. Sites will have to pay to license the technology to match submissions to the database, and to identify near matches as well as exact ones. Sites will be required to have a process to allow rightsholders to update this list with more copyrighted works. Article 13 punishes any site that fails to block copyright infringement, but it won’t punish people who abuse the system. There are no penalties for falsely claiming copyright over someone else's work, which means that someone could upload all of Wikipedia to a filter system (for instance, one of the many sites that incorporate Wikpedia's content into their own databases) and then claim ownership over it on Twitter, Facebook and Wordpress, and everyone else would be prevented from quoting Wikipedia on any of those services until they sorted out the false claims. It will be a lot easier to make these false claims that it will be to figure out which of the hundreds of millions of copyrighted claims are real and which ones are pranks or hoaxes or censorship attempts. Article 13 also leaves you out in the cold when your own work is censored thanks to a malfunctioning copyright bot. Your only option when you get censored is to raise an objection with the platform and hope they see it your way—but if they fail to give real consideration to your petition, you have to go to court to plead your case. The controversial measures in the new directive have been tried before. For example, link taxes were tried in Spain and Germany and they failed, and publishers don't want them. 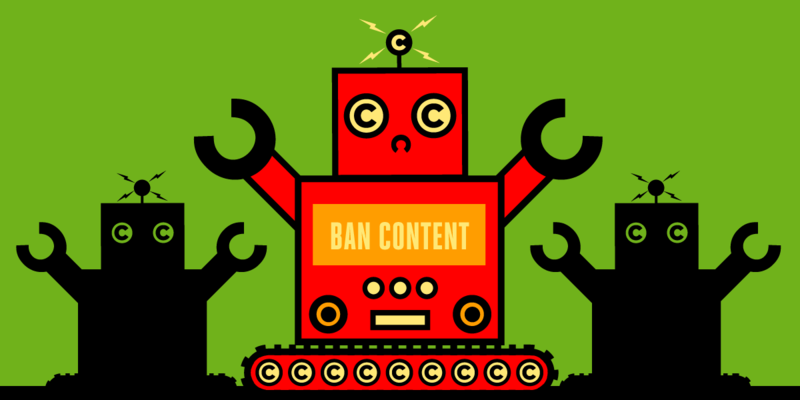 Indeed, the only country to embrace this idea as workable is China, where mandatory copyright enforcement bots have become part of the national toolkit for controlling public discourse. Articles 13 and 11 are poorly thought through, poorly drafted, unworkable—and dangerous. The collateral damage they will impose on every realm of public life can't be overstated. The Internet, after all, is inextricably bound up in the daily lives of hundreds of millions of Europeans and an entire constellation of sites and services will be adversely affected by Article 13. Europe can't afford to place education, employment, family life, creativity, entertainment, business, protest, politics, and a thousand other activities at the mercy of unaccountable algorithmic filters. If you're a European concerned about these proposals, here's a tool for contacting your MEP.